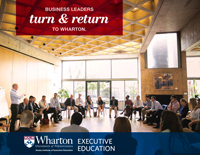 Thank you for your interest in Wharton Executive Education. This application should take approximately 15 minutes to complete and is required for your admittance to the program. If you cannot complete the full application at this time, please fill in your email address and click "Save Progress." You will then be sent an email with a link to your saved application. All questions are required unless marked optional. Please indicate the most recent institution you attended, the academic degree you earned (if applicable), and the date the degree was granted. Please list any executive education programs you have attended at other schools and the name of the school(s). Are you an alumnus/alumna of the University of Pennsylvania and/or the Wharton School? Do you have a parent organization? How many total years of work experience do you have? How long have you been employed by your present organization? How many people report to you? Please summarize your primary responsibilities and briefly describe your reporting relationships. What are the business challenges that are prompting you to take this program? What are the professional development goals you hope to achieve as a result of attending this program? What particular strengths will you bring to the program? Please attach a résumé or career summary. Your application will not be considered without this information. Your attachment must be an Adobe Acrobat, Microsoft Word, or text file with a .pdf, .doc, .docx, or .txt extension. Please use browsers Chrome, Firefox, or IE11 and above. How will you fund the program? *Individual’s name, title, email, and phone are required. 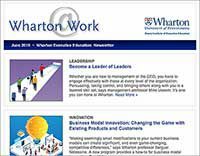 Read Wharton Executive Education's cancellation and transfer policy. In case of technical problems contact: execed@wharton.upenn.edu.